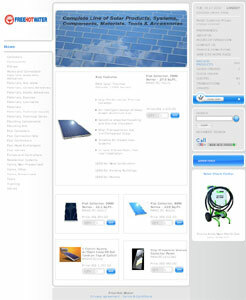 ← Free Hot Water signs Agreement with Helios Solar to Distribute SOREL Thermal Controllers in the U.S.
Vancouver, Canada – August 17, 2010 – XM Developments – North America http://www.XMDevelopments.com just completed an implementation of its eCommerce solution, XM Oxygen, for national solar thermal manufacturer and distributor, Free Hot Water, which is based in San Jose, California. The increasing amount of B2B sales transactions conducted over the Internet has accelerated the need for eCommerce solutions like XM Oxygen. “What Free Hot Water was seeking was a web store solution that had a far deeper level of back office integration than traditional mid-market eCommerce offerings,” notes Jim McLean, President of XM Developments – North America. “They recognized the value in offering their customers the ability to transact with them in real-time, over the Internet, at any time of the day or night to place orders, track order/shipment status, and to view detailed account transaction information. What’s more, because XM Oxygen is a SaaS solution, we ensured Free Hot Water avoided a costly, time-consuming deployment,” McLean adds.